This is my new whole wheat bread recipe! Both my husband and I liked its flavor, and I liked the easy workability of the dough. It makes great toast and sandwiches. Turns out my daughter-in-law had found this recipe in her cookbook and has been making it too, with good success. I updated the directions to incorporate Instant yeast – I like the flavor of the instant yeast and also like getting my bread done fast! I like Fleishmann’s Instant yeast, SAF instant yeast or bread machine yeast. Check out our mixer bread information HERE. Remember, you can also make this recipe by hand too, the way I did for years. This is from "Land O'Lakes Treasury of Country Recipes 1992 "
If you want to make 1 loaf, click HERE to find the same recipe made in the food processor. Heat liquids and butter to 120-125°. Combine dry ingredients (except 1 cup flour), eggs and honey. Mix with paddle attachment, gradually adding liquid mixture, then last of flour until dough leaves sides of bowl. Change to dough hook; knead 6 minutes on #2 setting. Leave the dough in the same mixer bowl, cover it and let rest in warm place 10 minutes. Turn out on board, divide in half. Shape into 2 loaves (about 1# 12 1/2 ounces each) and place in greased 9 x 5" pan. Cover loosely with sprayed plastic wrap or waxed paper. Let rise until dough is 1" above sides of pan or about doubled - about 20-25 minutes. Bake in preheated 350° oven for 25-35 minutes. Cool on wire rack. For a country crust, brush tops of loaves with softened butter. This recipe NEEDS 9 x 5" pans. 2011 Cost: $1.91 per recipe or 96¢ per loaf - 6¢ per slice. Yield: "Two 9 x 5" Loaves"
Per Serving : 126 Calories; 2g Fat (15.0% calories from fat); 4g Protein; 23g Carbohydrate; 1g Dietary Fiber; 17mg Cholesterol; 220mg Sodium. Exchanges: 1 1/2 Grain(Starch); 0 Lean Meat; 0 Non-Fat Milk; 1/2 Fat; 0 Other Carbohydrates. I looked forward to this recipe since your mention of it, Sue, and will try it out when I bake later this week. A question: do you ever use vital wheat gluten in your breadmaking? After hearing about the stuff for quite awhile, I decided to buy some and test drive it in some of my recipes. In the recipe I use to make wholegrain buns, the gluten seemed to improve the texture of the finished product (I used Bob's Red Mill Vital Wheat Gluten). My understanding is that it also increases shelf life somewhat, but my breads never sit on a shelf for long. It didn't work well in my favorite noodle recipe, though; made them a little too chewy. An additional question: have you ever added a small amount of vinegar (I think it's 1 T per loaf) as a preservative against mold? 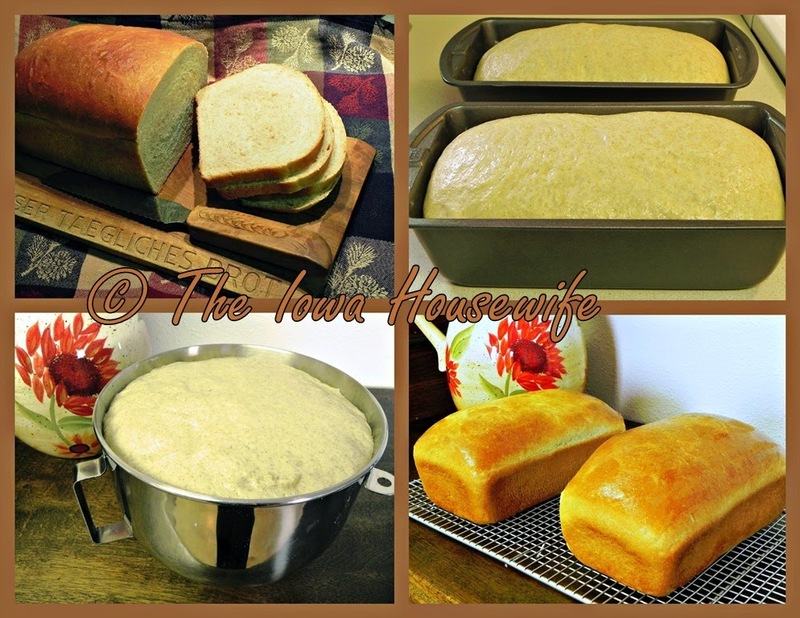 Again, my breads seldom sit for long, but during our hot, humid Iowa summers, I've had a loaf or two go bad over weekends when Steve and I were traveling. I don't think you'll find you need the vital wheat gluten in this recipe - it's not entirely whole grain. It does help in 100% whole grain or heavier bread doughs. I haven't tried the vinegar, but I don't see why it wouldn't work in that small an amount - I don't know if it actually helps with mold. We freeze our bread, sliced to keep it from molding. We like it toasted, and toast it without thawing. I realize this was posted several years ago, but wanted to comment on the use of vital wheat gluten. I use it in my bread making all the time. I rarely buy bread flour now. I use all purpose flour & add 1 tsp of wheat gluten per cup of all purpose, oat or whole wheat flour. I agree that vital wheat gluten works, I just find bread flour easier to find to buy, and cheaper for me.